You may already know some of Incase's iPad cases made for the original iPad and sure, some of them are pretty good. 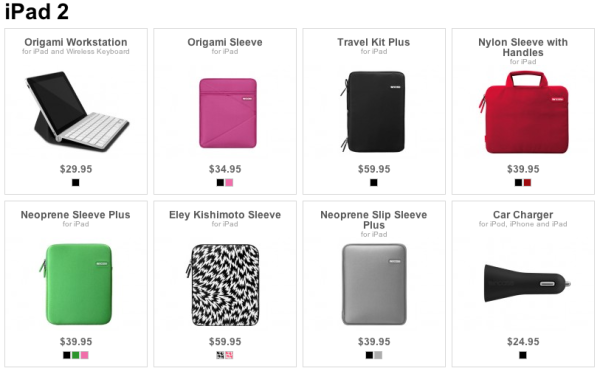 Just a few days after the iPad 2 got released into the public, Incase opened up an iPad 2 product page with some of their current cases that were originally made for the thicker first generation iPad and dubbed them, iPad 2 compatible. No. There is no reason why you should pay so much money for these cases that were not even designed to exclusively fit the iPad 2. They may in fact work but they are not in any way designed for the iPad 2. If you like Incase's iPad cases, then you should wait to see if they ever tailor-make their cases to exactly fir the thinner dimensions of the new iPad 2. It's a shame Incase are rushing out to bank on new iPad 2 buyers this way.